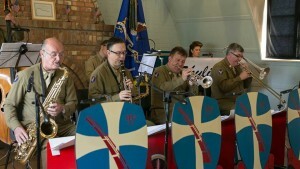 The Skyliner Band is more than just a band, it is a truly 1940’s experience. We are a nine piece band comprising: two saxophones, trumpet, trombone, a rhythm section plus male and female singers. Further information on band personnel can be found in the “Meet The Band” tab. Skyliner’s specialist repertoire is unique and unrivalled. We research the 1940’s dance scene to find out what present day Swing, Balboa and Lindy dancers like to dance to. We then scour the world to obtain rare, long out of print music that emulates the sound of the original recordings played by DJ’s. We only play from vintage arrangements or transcriptions, rather than modern day interpretations which many bands pass as 1940’s. Our repertoire is extensive from the standard big band library through to music more suited to a serious dancing audience. It is not just the repertoire that receives such close scrutiny. We also dress in historically correct 8th Army USAAF enlisted men’s uniforms. Enlisted men’s uniforms were worn by all USAAF bands, including Glenn Miller’s AAF band, rather than the officer’s uniforms frequently worn by bands today. Replicas of stands used by Glenn Miller, bearing the SHAEF logo (Supreme Headquarters of the Allied Expeditionary Forces), complete the look, as shown in the attached photographs. We are the band that plays authentic 1940’s Dance Music, looks like a band from the 1940’s and sounds like a band from the 1940’s. Skyliner is equally at home playing at Village Hall Dances or 1940’s Festivals, we taylor our music to suit the situation.